Who killed @MexicanMitt Romney’s Twitter account? And why? Has the wildly popular and hilarious Twitter parody account @MexicanMitt self-deported? That’s what many of his fans and followers are asking on Twitter tonight. Mexican Mitt has been named as the Number One funniest parody political account on Twitter by Politico, and has been lauded by several sites and countless Twitter users and journalists, and even mentioned by Rachel Maddow on MSNBC and the L.A. Times. Mitt Romney’s Mexican alter ego no doubt has pissed off somebody very important, or has been the victim of a coordinated reverse-spam complaint attack from humorless right wingers. Or worse. Besides pointing out the convenient timing on the eve of the RNC speech, there’s the appearance of a new, promoted Mitt Romney campaign Twitter topic. Hmm. Twitter has yet to respond to numerous press inquiries, including from our friends at LatinoRebels and at NBC Latino. Pocho operatives are attempting to smuggle a reverse-engineered and duct-taped Twitter machine to Mexican Mitt and he may have to Live Tweet the Mitt Romney speech that way. Below see some of the tweets in supper of the #FreeMexicanMitt campaign now underway on Twitter. 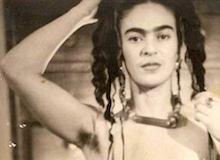 RT @gabbklein: . 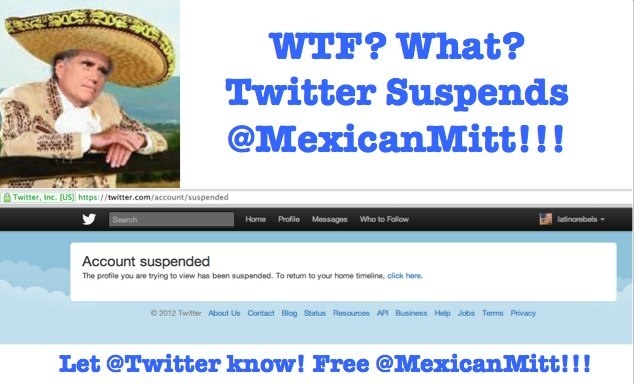 @Twitter suspended the clever satirical @MexicanMitt the night of @MittRomney’s #RNC2012 speech. @GabrielaRM @MexicanMitt has been kicked off Twitter just in time for Mitt Romney’s RNC address. He’s a satirist! @ElBloombito: Mi amigo @mexicanmitt esta que suspendido? 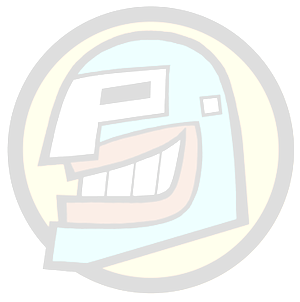 No esta coolo! And many many more are pouring forth. FREE MEXICAN MITT! Image courtesy our friends @ LatinoRebels. I figured out more new things on this fat reduction issue. A single issue is that good nutrition is tremendously vital any time dieting. A massive reduction in fast foods, sugary foodstuff, fried foods, sweet foods, red meat, and white colored flour products could possibly be necessary. Holding wastes bloodsuckers, and toxic compounds may prevent goals for shedding fat. While specific drugs temporarily solve the situation, the bad side effects are certainly not worth it, plus they never give more than a non permanent solution. It’s a known incontrovertible fact that 95% of celebrity diets fail. Thank you for sharing your notions on this blog site.